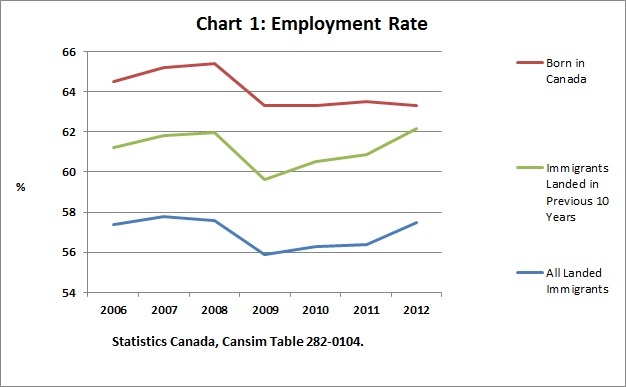 Citing the OECD’s International Migration Outlook 2013, he writes that “employment for foreign-born Canadian citizens has gone up since 2008, while it has stalled for native-born citizens” and that “the employment rate for Canadian immigrants in 2012 was the third highest in the OECD.” In his view, “this shows that immigrants are quickly integrating into the labour force and putting their skills to work.” It is true that the job prospects of immigrants have improved since the Great Recession of 2009-09 and that the reforms in immigration policies introduced by the Conservatives have improved immigrant selection slightly, However, Gignac makes too much of this overlooking that it still leaves the employment rate for immigrants below that of the native born (Chart 1). And more importantly he ignores the even more inconvenient fact that recent immigrants still in 2010 only earn about 63 cents per dollar earned by other Canadians. Gignac makes much of the contribution of immigration to Canada’s growth prospects. He even suggests that it is an important factor explaining “Canada’s strong economic performance since 2008.” Well, it’s hard to see how real GDP growth averaging 1.2 per cent per year between 2008 and 2012 can be characterized as “strong economic performance.” Real GDP growth in the United States averaged 1.1 per cent over the same period and it hasn't been suggested that that's strong. 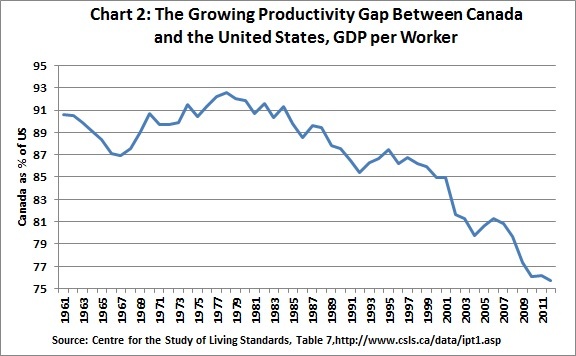 More worrying, since 2008 Canada’s productivity levels measured by GDP per worker have, according to data published by the Centre for the Study of Living Standards, continued to fall relative to those in the United States, declining from 79.7 per cent in 2008 to 75.7 per cent in 2012 (Chart 2). This should be especially troubling as declining relative productivity is associated with declining relative living standards (a common measure of prosperity). And it could be argued that the low productivity and earnings of recent immigrants is a factor that could be contributing to the growing productivity gap. Immigration does contribute to overall GDP growth, but it does not necessarilly lead to growth in per capita GDP. Gignac argues that without immigration “Canada’s population aged between 20 and 44 years old would be declining” and that “that cohort, which constitutes most of the labour force, is the one that creates new households, buys new houses, has children and pays the greater part of taxation revenue.” Gignac goes on to claim that “without immigration, Canada’s natural population growth would not be enough to sustain economic growth and welfare.” This all sounds very plausible to those who are unfamiliar with the dynamics of Canadian demographics, however, the facts do not support Gignac’s argument. To the contrary, Census data shows that the number of people in the 20 to 44 age group actually did decline slightly from 11,052,375 in 2001 to 11,018,745 in 2011. While this is only a small, and relatively insignificant, decrease in absolute terms, as a percentage of the total population, it constitutes a more significant drop from 36.8 per cent to 32.9 per cent. By the same token, the median age of the Canadian population continued to rise from 37.6 in 2001 to 40.6 years in 2011. This indicates that even at very high rates of immigration experienced in recent years Canada still faces a huge demographic problem stemming from the aging of the population and growing demands for health and social services. In this regard, it is useful to recall the conclusions reached by Yvan Guillemette and William Robson in a study namely that: “Whatever the benefits of immigration to Canada’s economy and society, and immigrants themselves, immigration cannot relieve Canada of the challenges of an aging population.” The explanation for this important observation is that immigrants also age and their average age is not so much lower than that of the existing Canadian population that it can bring down the average (or median) age. Indeed the problems of providing for an aging population can be compounded by immigration if immigrants do not earn enough to pay for their own retirement including health care. In fact, it may not even be necessary to wait for the immigrants to become senior citizens for the fiscal burden to materialize if they earn much less than other Canadians as data suggest they do. Herbert Grubel and I estimated in a recent study that, after taking account of the average taxes paid and government services consumed by other Canadians and recent immigrants, they received about $6,000 more in government benefits in 2005 than they paid in taxes, whereas other Canadians received benefits equal to the taxes they paid. In total, under different assumptions about the number of recent immigrants still in Canada and depending on the final year to which the calculation is applied, the fiscal burden from the post 1987 cohort of immigrants was in the $16 to $23 billion range, which is a large number even in the government's books. It can't be denied that a sensible immigration policy could contribute to Canada’s future prosperity by selecting talented future immigrants who will be capable of earning enough to pay their own way and/or innovating and creating high paying jobs (which of course is much more difficult to assess). This would definitely raise the level of per capita real GDP and hence prosperity. However, Gignac’s assertion that a continuation of the current policy of high mass immigration is the road to prosperity is not supported by the evidence. This policy is clearly not working as intended and needs even more ambitious reforms than have already been introduced by the Conservative Government if immigration is to be transformed from a net negative to positive impact on Canada’s prosperity. This, of course, is not to say that the Government might not be pursuing a policy of high immigration for non-economic reasons such as promoting diversity or attracting immigrant votes, but let's not pretend it's about economics if the evidence suggests it isn't.